Like his brother Jean-Baptiste, Jean-Marc Nattier first trained in his family circle. His father was a portrait painter and his mother was familiar with the technique of miniature painting. From an early age Jean-Marc revealed a natural talent for drawing and copying compositions and passages from the work of other artists with outstanding results. While still a teenager he won a first prize for drawing from the Académie. Under the protection of Jean Jouvenet, Nattier’s first activities in the world of art seem to have been connected with illustration and we know that many of his early drawings of paintings by Rubens and Le Brun were produced as the basis for engravings. Nattier was admitted to the Académie in 1717 as a history painter with a composition on a mythological subject. His greatest success, however, was to be in the field of portraiture, a genre that had not previously been highly esteemed in academic circles. Nattier’s skills in this genre are reflected in the words of his first biographer, his daughter, who married the painter Louis Tocqué. She recounts how Louis XIV praised the artist when he presented the monarch with a drawing for a print based on the king’s portrait by Rigaud. It would be his portraits of courtiers and members of the middle classes that brought Nattier most success, and he was extremely skilled at capturing the physical appearance of his sitters, combining a lifelike presentation with a high degree of idealisation. His sitters are presented in the guise of gods or allegorical figures recognisable through their attributes and transformed by Nattier’s exquisite handling that renders their forms with delicacy and subtlety using harmonious, transparent tones. The present Portrait of Madame Bouret as Diana is a fine example of this type of work. 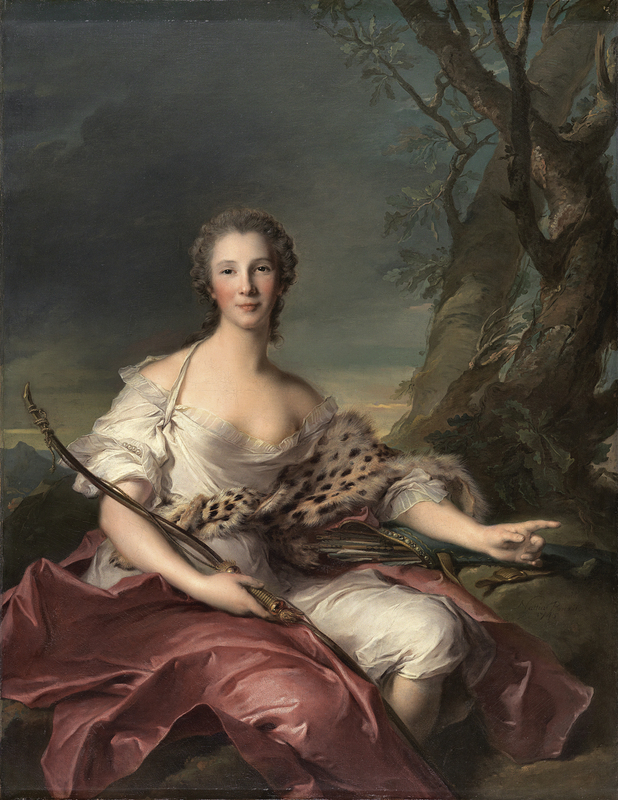 The sitter, transformed here into the goddess Diana, is set against a natural background that is appropriate to her characterisation as goddess of the hunt. Nattier depicts the background in cool tones and with few elements, giving most emphasis to the sky. The figure is depicted seated and looks directly out of the canvas, pointing with the index finger of her left hand to something outside of our field of view. The bow in her lap, quiver and arrows on the rock, and the soft leopard skin over her arm are all symbols of the goddess Diana. The result is an elegant portrait in which this naturally posed young woman looks out at the viewer with her brilliant eyes and a dreamy, sweet gaze. In a manner typical of the artist’s work, Nattier pays considerable attention to the sitter’s costume, clothing her in a light tunic whose whiteness offsets the pale tones of her flesh and which falls down in a studied manner to reveal the upper part of her breast. The sitter is identified as Madame Bouret in the 1958 catalogue of the Collection, based on the description of the painting when it was in the Blumenthal collection in Paris in the 1930s. Of Portuguese origin, Madame Bouret’s maiden name was Tellez d’Aosta. In 1735 she married Etienne Michel Bouret, treasurer and “fermier general”. The present canvas is signed and dated 1745 and corresponds to one of the best periods of Nattier’s output.